During the revolutionary period the Soviets came into political and cultural conflict with Russia’s Muslims. Despite indications that the majority of Muslims desired political unification based on their Islamic heritage, the Party divided them into separate “nationalities” along narrow ethnic lines, incorporated most into the RSFSR, and attempted to uproot traditional Islamic institutions and customs under the aegis of class war. Resistance took the form of pan-Muslim nationalism, a reformist political conception with roots in the Near East. This conflict not only aborted the export of revolution to the Islamic world, contributing to the passing of the revolutionary era in Russia, but aided Stalin’s rise to power. 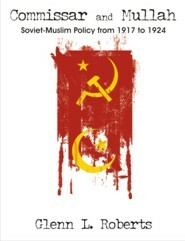 Soviet policy succeeded politically, defining the terms of interaction between Russians and Soviet Muslims for the next 70 years, but failed culturally in 1921-22, when the Party was forced to suspend its “war on Islam” as the price of political control. Glenn L Roberts is an attorney and translator with Pro-Lex Services, specializing in Arabic legal translating. Roberts is a student of the Islamic Sharia in international law and Central Asia.